Mary Cassatt (1844-1926), “The Mandolin Player,” c.1872, oil on canvas. Mary Cassatt, one of the leading artists of the late 19th century, began as an art student in Pennsylvania. At age sixteen, she enrolled in Philadelphia’s Pennsylvania Academy of the Fine Arts. Frustrated by the resentment and occasional hostility she received from her male classmates, Cassatt decided to venture to Europe where she could study great masterpieces in person and hopefully ingrain herself in the art community there. She earned money for her first trip to France by completing a commission from a Catholic bishop to do two Caravaggio copies for a cathedral. After arriving in France, Cassatt wasted no time making copies at the Louvre, working with live models and studying under Jean Leon Gerome. Following her studies with Gerome, she moved to the French countryside where she began painting the peasants who lived there. 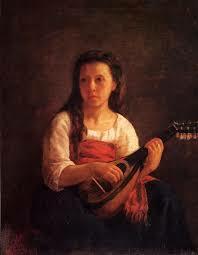 Her time there inspired her painting The Mandolin Player, which was accepted to the Salon in 1868. Not long after meeting Degas and forming what would blossom into a life-long friendship, Cassatt decided to join the Impressionists in 1877 and exhibited with them in 1879. She hung eleven of her works at this exhibit, including Woman with Pearl Necklace. Mary Cassatt (1844-1926), “Mother and Child,” 1890, oil on canvas, 35.4 x 25.3 inches. Wichita Art Museum, Kansas. 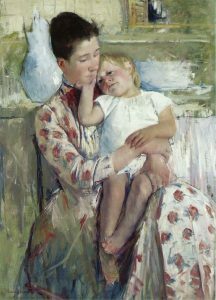 It was not until later in her life that Cassatt pursued the subject she is most famous for – mothers and children. She first experimented with the subject by painting her sibling’s children but soon found she was drawn to mothers and children in lower classes. It is believed that lower class mothers made more appealing models because mothers in rural areas held their children more naturally than those in the upper classes, many of whom employed other women to help them raise their children. Cassatt enjoyed a relatively long and successful career, during which she sponsored other Impressionist painters and became an advisor to several major American collections.